Okay, yes—what isn't better with Space Jam? Regardless, it's rather entertaining to watch Captain Falcon spike a bunch of fools off Smash Bros. stages to that very tune. It helps, of course, that spiking is one of the most gratifying things to do in Smash Bros. games. Of course it's a joy to watch BushBoyFalcon pull it off over and over again in the 3DS version of the game. Heck, I'd go so far as to say that sending your opponents to your death like this is actually more satisfying than landing a well-timed falcon punch. Spiking takes a bit more skill, and (if you're bad like me, I guess) you sometimes actively endanger yourself while trying to land one—you often have jump off the stage to pull it off, after all. Certain characters plummet to their death if they don't get it just right, but everyone knows that a spike can be as rewarding as it can be dangerous. And there's something profoundly badass about spikes too—something very final, something very forceful. You become a bit more fearful of anyone that can pull off a spike on you, too. Spiking is the embodiment of rekt. That's why I love it. 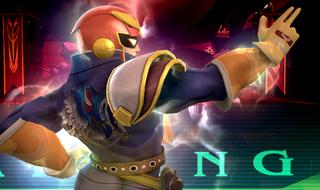 Falcon punches get all the hype because they're flashier, that's all.